A long time ago, in a year far away (2004), the immortal Laurence Simon, via his Blog Is Full of Crap (RIP IFOC! 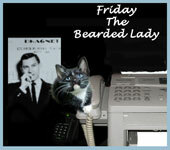 ), became known as "King of the Cat Bloggers" for starting the Carnival of the Cats. His idea was for a weekly confab of the best of the week’s cat blogging posts about cats from bloggers all around the world. 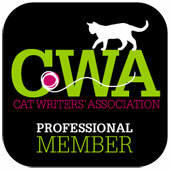 People who normally blog about anything and everything, as well as the emerging Community of Cat Bloggers, enter their week’s best cat related blog posts into the carnival. For those who rarely share stories about their cats, it’s a vacation from blogging about such things as politics, war...and knitting. I like how Laurence explained it: This is a way of "demonstrating that even the mightiest and meekest of pundits have a love of cats in common." 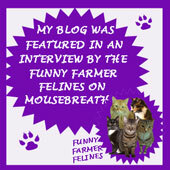 For us Cat Bloggers the Carnival is a chance to discover blogs we might never have heard of, on subjects of all kinds. When Time Magazine takes notice of you, and of the growing Community you are a part of, as they did Laurence and his Carnival, then you know your effort, and the world you are helping spread the word about, are making an important impact in the lives of people, and Cats, everywhere. In late 2007/early 2008 the King relinquished his responsibilities for running this show to the original Cat Blogosphere, which no longer is at its original link or run by those who took on the task of running the CoTC. We are cats who blog. And some humans who blog about cats. Some humans will tell you it’s really all humans who pretend to blog as cats. Now, humans are notoriously unreliable and kill each ofur silly stuff like munny and lie about who they slept with and whatnot. So who are you gonna believe, huh? Believe who you wants. We cats don’t care. The origins of cat blogging are lost in time and cyberspace. 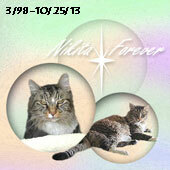 Many, many of us were inspired by Psychokitty Max and Timothy Dickens, the first cat bloggers most of us met. 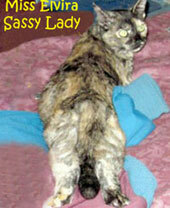 Many more were inspired by Laurence Simon, King of the Cat Bloggers and his Carnival of the Cats. And a huge hattip goes out to Jay Dyke’s The Mows cat comic, where many, many of us saw the link to Psychokitty and got introduced to the whole idea of being able to blog even tho we’re cats." That explanation barely scratches the surface of what this phenomenon is all about. When Lair gave up the Carnival to the original Cat Blogosphere to maintain in January 2008, Robyn took care of managing it and a CoTC Home Site, until she had health issues at which time, she gave it to me to manage. That was in November 2008. I still host the Carnival of the Cats but, in early 2014, due to my health issues, Kiril and one of his cat, Elvira Mistress of Felinity graciously began to assist me with the site and to continue their doing most of the hosting duties as their blog, The Opinionated Pussycat, had been doing for several years beginning under Mr. Nikita, originally at Daddy Kiril's own blog, The Mad Macedonian. 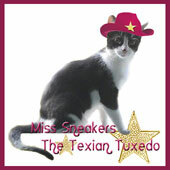 Before pet blogger conventions and awards, before the pet industry and rescues/shelters gave a hoot, before many other familiar aspects of the online pet niche, there was Carnival of the Cats. What did it do in its 11+ years that meant it truly MATTERED to the development of Pet Blogging? Poke the box…cardboard box, litter box, big box, small box, hell, any box will do, I am…YOU are cats…poking boxes is something we enjoy. Carnival of The Cats made a difference once upon a time. Facebook, Twitter, Pinterest, Instagram, Google +, LinkedIn, Mr. Linky, InLinkz, online communities such as Blog Paws, several annual conventions and more, have allowed for more platforms to share ones pet blogging, some more popular than others. Let this archive be a record, though incomplete, of the CoTC difference....an entry point, for any curious feline, to the world of cat and pet blogging as it grew during its first decade plus. 201 = Missy, KC, Sol & Smokey 202 = Bad Kitty Cats 203 = When Cats Attack! 268 = Kashim & Othello 269 = Life From a Cat's Perspective 270 = When Cats Attack! 312 = Opinionated Pussycat 313 = Opinionated Pussycat 314 = When Cats Attack! 315 = One Cats Nip 316 = Mind of Mog 317 = Opinionated Pussycat 318 = When Cats Attack! 329 = Mind of Mog 330 = Opinionated Pussycat 331 = When Cats Attack! 332 = Kashim & Othello 333 = One Cats Nip 334 = I, Meowza 335 = When Cats Attack! 342 = One Cats Nip 343 = Mind of Mog 344 = When Cats Attack! 351 = Opinionated Pussycat 352 = Mind of Mog 353= When Cats Attack! 367 = Billy SweetFeets 368 = Opinionated Pussycat 369 = When Cats Attack! 377 = CatSynth 378 = Mind of Mog 379 = Opinionated Pussycat 380 = When Cats Attack! 427 – Opinionated Pussycat 428 – Mind of Mog 429 – When Cats Attack! 444 – Opinionated Pussycat 445 – Mind of Mog and When Cats Attack! When I clicked on the link, I expected an archive of links. I was totally blown away with the legacy. Awesome, awesome! Thank you so very much.